Between 30 and 40 million people in Europe suffer from rare diseases—many of them children. As most of these diseases have genetic origins, gene therapy is a major hope for their future cure. Until now, however, there have been very few successful trials. Now, the EU-funded project AIPGENE, due to be completed in 2014, may have made significant progress in a gene therapy approach. 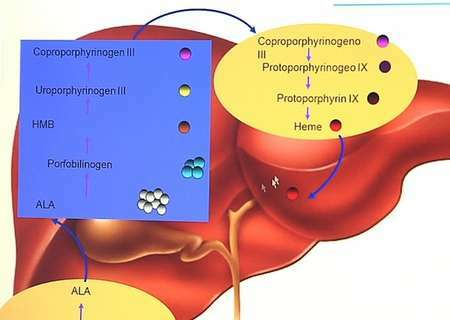 The project focussed on the genetic liver disorder, Acute Intermittent Porphyria (AIP). Through an early stage clinical trial, in phase I, it demonstrated the viability of a new approach, based on a so-called, adeno-associated vector (AAV). This is a 'DNA transporter' derived from a type of virus and carries the therapeutic gene to liver cells, known as hepatocytes. "If we are able to correct enough hepatocytes and give them the gene that has not been expressed in those hepatocytes, we will not only be able to treat Porphyria, but also many other diseases in which the target organ is the liver," says project coordinator Gloria González-Aseguinolaza, who is also director of the gene therapy and regulation of gene expression programme at the Centre for Applied Medical Research (CIMA) at the University of Navarra, in Spain. This brings renewed hope for the viability of gene therapy to cure rare genetic diseases. Gene therapy exploits modified viruses, such as AAVs, as carriers of therapeutic genes. So the less likely the virus is likely to bring illnesses to humans, the easier it is to succeed in a clinical trial. It is particularly suited for disorders where only one organ is affected. And where the correction of a single gene can reduce the effect of the disease or even heal it. Unfortunately, there can be side effects. In previous studies of treatment of Haemophilia B, for example, researchers used what is referred to as an AAV serotype 8 (AAV8). But scientists found that there was an increase in, so-called, transaminases, which indicates liver injury. Although they were cured, patients had to receive immunosuppressive treatment. In the Porphyria trial, the patients did not suffer these side effects. "We used an AAV serotype 5 (AAV5). Because we observed from animal models that this serotype has a strong liver tropism," González-Aseguinolaza tells youris.com. This means that AAV5 seems to be more liver specific and not as commonly used as AAV8. One expert sees an advantage in administering the therapeutic gene through AAV5. "Serotype 5 can be used in those people who developed antibodies against [serotype] 8 and also in the cases when the therapeutic gene has to be re-administered after 10 or 20 years. For example in people with AAV8 who have by then developed antibodies against it," says Carlo Viscomi, a senior investigating scientist at the Mitochondrial Biology Unit of the Medical Research Council in Cambridge, in the UK, and at the Molecular Neurogenetics Unit of the Carlo Besta Neurological Institute, in Milan Italy. Indeed, a large percentage of the population has encountered these viruses, usually in childhood. And their body created antibodies against them. Another expert concurs with the first. "These antibodies prevent the virus from entering your target cells. This means that if we inject the virus into the vein, for example, there are antibodies around, which neutralise it. So it does not get in and it has no effect," says Etiena Basner-Tschakarjan, senior scientist at the Center for Cellular and Molecular Therapeutics of the Children's Hospital of Philadelphia, Pennsylvania, USA. In fact, 50% of the population has antibodies against AAV8, due to having been in contact with the natural virus. Further challenges still lie ahead. One major problem is how to reach enough cells in the organ to correct the disease. "This is very difficult as it requires strong technology to improve both the production of the vector and its efficacy to enter the cells," adds González-Aseguinolaza. One additional problem is that "once the virus has reached its target, in some organs there seems to be a cellular response. And the cells that were successfully treated are destroyed," Basner-Tschakarjan tells youris.com, concluding: "Therefore, the positive effect at the beginning goes away."